My partner Mel and I have been travelling the world for just over 4 months. We are coming towards the end of our time in Asia and soon move onto Australia and New Zealand. We have picked up many low FODMAP travel tips on our journey (see our ‘FODMAP Travels‘ section) and have had many struggles finding food suitable for the restriction phase of the low FODMAP diet. Sometimes it would have been great to be able to pick up a low FODMAP snack, especially one where we could read the ingredients in English. Thankfully there are companies like Nicer Foods who specialise in providing low FODMAP snack options. They also have lots of great advice and tips for those eating a low FODMAP diet when out and about and also when travelling. So it was great to chat with Katelyn at Nicer Foods who has written a guest post giving us 7 expert tips on beating the problems associated with travelling and dealing with gut issues while sticking to a low FODMAP diet. In a perfect world, travelling would include reaching a state of Zen while meditating on top of a mountain, becoming a culinary expert while getting fully immersed in the local food culture, and finding yourself while doing paddleboard yoga during a sunset. Unfortunately, travelling is not always like what Instagram and Pinterest depict it to be and it can even be quite the opposite for those with IBS and GI issues. If you’ve been following Around the World in 80 Low FODMAP Dishes, then you know that it’s possible to actually enjoy travelling even if you’re on the low FODMAP diet. While you may not find your Zen mountain on every trip, being prepared with certain essentials can help minimize symptoms so you can enjoy your journeys! It’s easy to forget to drink water while you’re off seeing the sights but drinking enough fluids, especially if you have IBS-C, should be a priority. It can be helpful to carry a water bottle in your backpack so you don’t have to keep stopping to get something to drink or risk being far away from a source of water only to realize you haven’t drank anything all day. Hot weather can make you more prone to dehydration so if you’re sweating a lot, be sure to account for this by drinking extra fluids. When in Rome, do as the Romans do…unless that involves eating wheat or lactose (if you’re on the strict elimination phase of the low FODMAP diet). Instead of worrying about being stuck with nothing to eat besides foods that you react to, stock up on low FODMAP packaged snacks that can travel easily in your suitcase or backpack. Rice cakes, peanut butter, canned tuna, and our low FODMAP Be Nice Bars are just a few of the convenient snacks available! If you have a go-to medication or tea that helps calm your stomach during a flare, be sure to pack it! That way if you do have an IBS flare, you will be prepared and hopefully be able to ride it out and get back to your travels as soon as possible. These items are not an essential if your destination includes a five-star hotel stay, but if you are going to be roughing it in the woods or a developing country, toilet paper and baby wipes can be a lifesaver for someone with IBS. If you are travelling to a county where you do not speak the language, it’s very helpful to create a list of translations for high and low FODMAP foods. You can also learn how to ask for meals without certain ingredients to make your ordering experience go even smoother. If you are travelling with a guide, you can explain your dietary restrictions to them ahead of time so they can help you find meals that you can eat. Before you leave, you can also research popular dishes and common ingredients used in the region to help you get an idea of what you can and cannot eat. Bringing your own seasoning can add flavour to your foods if you get stuck with ordering plain chicken or a bland salad, but be sure you use your common sense before trying this! This strategy works best if you are buying a meal to-go. Some convenient seasoning options are packets of lemon juice, vinegar, soy sauce, and good old salt and pepper. The final, but arguably most important, low FODMAP travel essential is the understanding travel buddy. Travelling with someone who is willing to try three different restaurants until you find one with something you can eat and offers to help you carry your other low FODMAP essentials in their backpack will make the trip much more enjoyable! What are you waiting for? Grab your low FODMAP travel essentials and get ready for the journey of a lifetime! Katelyn Collins is a dietetic intern (registered dietitian in training) and the driving force behind the Nicer Foods low FODMAP blog and social media accounts. Nicer Foods is a FODMAP friendly food company that makes products for people with food sensitivities, food allergies, coeliac disease, wheat intolerance, and other digestive issues. You can purchase their low FODMAP products at NicerFoods.com and follow them on Facebook, Twitter, and Pinterest! Great article-I wanted to mention that in the seasoning paragraph soy sauce should be gluten free! It contains wheat-gluten free soy sauce is widely available. Thanks Gluten free lady. For the low FODMAP diet you do not need to have gluten free soy sauce the process of producing soy sauce lowers the fructan content of the wheat so it is low in FODMAPs. Thanks for that Lady Red specs, very excited about coming to Oz. Pingback: voyager & suivre la diète faible en fodmaps | Gourmande, mais pas trop! R&M Dietetic is Mel Rendall and Lee Martin, two fully qualified dietitians registered with the HCPC. We offer private consultations for adults and children for a wide range of nutritional concerns and specialise in gastrointestinal health. Please see our consultations page for further information. 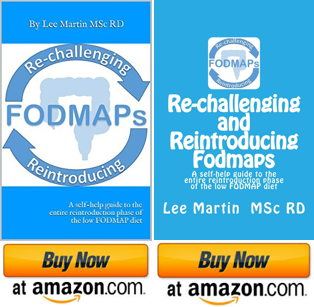 Lee recently published ‘Re-challenging and Reintroducing FODMAPs' the first ever book dedicated to the reintroduction phase of the low FODMAP diet. This is available to purchase on Amazon Kindle and Paperback, just click the image below for details. Re-Challenging & Reintroducing FODMAPs The Book! Find useful low FODMAP information. Go on, give it a go, search for something….